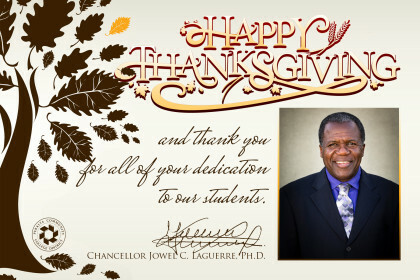 This Thanksgiving all of us can reflect back on our successes throughout the year and give thanks to our colleagues, our students and everyone who made success possible. I want to thank all of you for everything you have done to make Peralta a better, more caring place this year. In the wake of the elections, as I have written, I want to again assure you, the Peralta Family, that we will continue to embrace basic human rights, our values and the Academic Freedom that makes Peralta an enduring institution. Peralta will remain a safe place for the expressions of cultural identity and documentation status, and no one will be silenced out of fear or prejudice. Education is our mission and we will continue, as we have for more than 50 years, to bring educational excellence to everyone–no matter their background–in our East Bay community. Happy Thanksgiving and best wishes to you and your family.